One of the best things about talking food with other food enthusiasts (apologies for using that term in overabundance, I just hate the term “foodie”) is the resulting recommendations that come from discussing where you love to eat. There’s a look in the eyes – a widening, a sparkle – that tells you all you need to know. I get that look about many, many things that I have eaten. After Chicago, I couldn’t talk about the food at Chicago Diner without getting a little misty eyed. I speak in similar ways about the taco stand at Las Palmas, the Shakshuka at Sababa Middle Eastern Grill, the buffalo seitan wings at Spak Brothers. Sylvia, from Burgh Bits and Bites, had that look when she talked about the meles at Colangelo’s. The question, “Ooh, what’s a mele?” nearly sent her teetering off her chair. 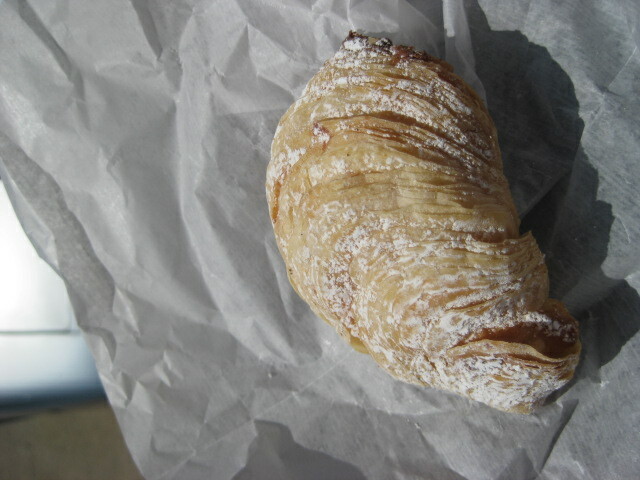 Meles, apparently, are one of the most delicious pastries invented by man, and Colangelo’s offers some of the best. I take recommendations fairly seriously, and when it’s a real rave review, I make a point of adding the place or item onto my mental list of things to try. So, on a short trip through the Strip on Saturday, I happened by Colangelo’s and decided to make good on her recommendation and my curiosity. Sylvia, if you’re reading this: HOLY CRAP! WHAT HAVE I BEEN DOING ALL THESE YEARS WITHOUT THESE MELES IN MY LIFE? I ordered an apricot mele, and hoo boy… I’ve never had a pastry where the least impressive thing about it was the filling. And the apricot filling was very good, just not as spectacular as the pastry. Lightly sugared to give it a sweet crunch, it was still chewy and soft in all the right ways. Despite all the sugar, it wasn’t overpoweringly sweet, like a cheap danish or pastry. It had the slightest essence of vanilla that blended smoothly into the burst of citrus flavor from the apricot preserves. About the size of my (admittedly small) hand, it was almost too much for me to handle alone. I split it in two and shared with my friend, Mo, whose reaction matched my own. How have we not tried this before? All the time I’ve spent in the Strip District and I never once tried this amazing little treat? I meant to buy two meles, but the clerk misheard me. Flustered by the noise and crowd building around the counter, but still determined to get two pastries, I asked for something a bit more familiar to me: Sfogiatelle. The Italian name means “many leaves” or “many layers” so it’s easy to understand how the treat got its name. The shell shaped pastry is comprised of flaky pastry layered one on top of the next. The inside is a slightly creamy, almost cheesy filling, but it’s so subtly worked into the pastry, you barely notice it until after the bite. Because Colangelo’s was a bit crowded, I took my treats to my favorite eating spot: The walkway outside of the Pittsburgh Public Market. 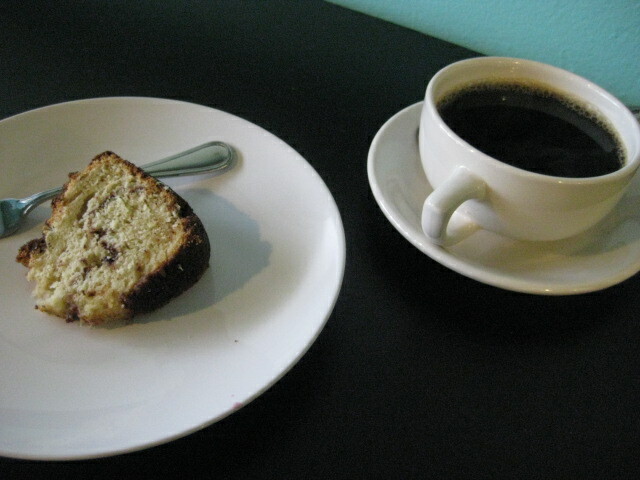 There I enjoyed my pastries, the first cup of coffee of my day, and a nearly perfect sunny Saturday morning. 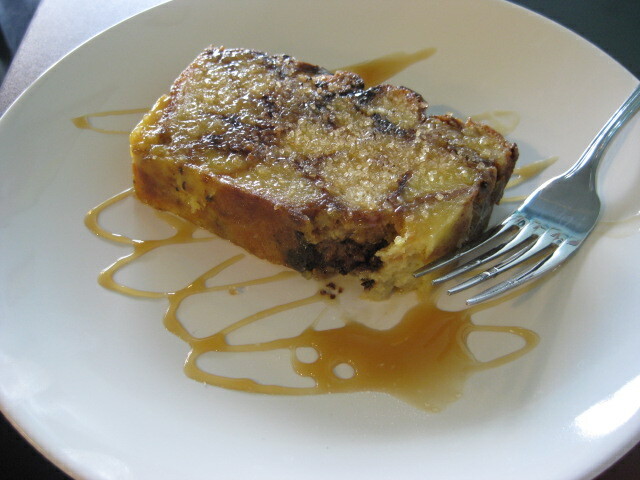 Good Morning, Salted Caramel Bread Pudding! Behold last week’s treat from Sugar Cafe. Some people like to get their sweet fix early in the day, some like to get it following dinner. Me, I’ll take my sweet fix any how and any time I can get it, which is how someone like me ends us eating a donut and bread pudding in the same day (and probably some Girl Scout cookies too). It is also how someone like me will never, ever be a super slender person. I’d go for the latter. In a heartbeat. What is the worth of living if I can’t eat something like salted caramel bread pudding? Isn’t this why we make and share and eat these things? Because they, in some way, contain the love that we feel for ourselves, feel for others? If cooking is an act of love that you perform for others, couldn’t eating something purely for taste and desire be considered an act of love for yourself? This Week on the Dormont-Brookline Patch: Sugar, Sugar! 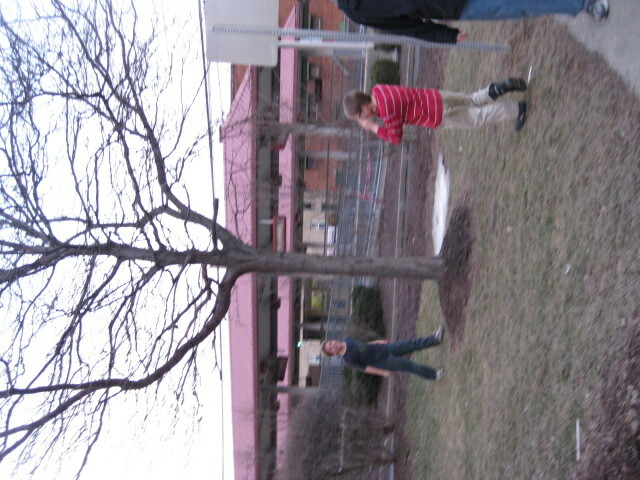 So normally, I am about five steps behind the happenings around town. Recently, I’ve become more in the know about newly opening restaurants, the buzzed about places, the comings and goings of the food life in Pittsburgh. Yet, I’m never on top of a story. Well, when you live down the street from a hotly anticipated, soon-to-open cafe, you keep your eyes peeled for signs of life. But how I found out that the Sugar Cafe was going to open on Friday morning wasn’t good scouting, but some terrific luck. 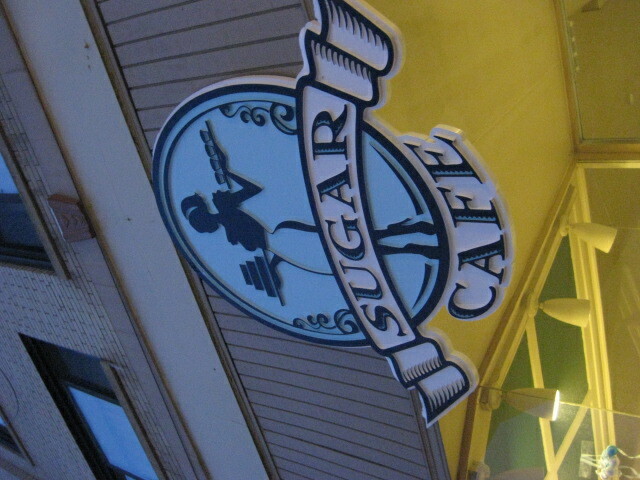 My pal, Jackie, who lives right down the street from me on West Liberty Avenue, was walking back from my apartment on Broadway sometime after midnight on Thursday, when she spied that the slowly deteriorating paper shrouding the big windows of Sugar Cafe had finally been torn down. I received a text and that was that. What a little blurb on the blog doesn’t tell you is that I have become borderline obsessed with this place. Okay, that’s a bit of a hyperbole. But for someone who has trouble working at home, it’s become a minor godsend. I get off the T a stop early at Potomac, stroll down to the cafe, have a cup of coffee, pastry (I’m just pretending that everything in the cafe is magic and doesn’t have calories), and sit down to write for a while. I know the whole thing of going to a cafe to write is seen as sort of pretentious, and maybe it is. You know what else it is? FRIGGIN SWEET. For my first weekday evening in the cafe, I got to sit down with the owner, Kelly James, to discuss her fantastic opening weekend. 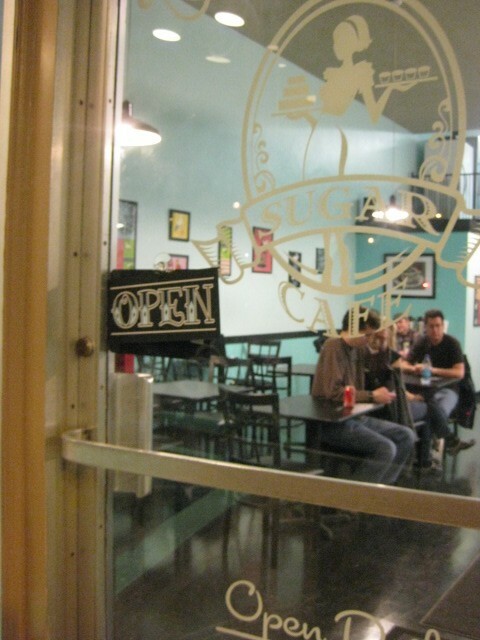 I definitely suggest reading the article, but more importantly, I highly recommend the Sugar Cafe. Come by any weekday between 5:30 and 6:00, and you’ll likely me see there, typing and sipping away. The much buzzed about, highly anticipated bakery-coffee shop, Sugar Cafe, opens today. I will definitely be making a stop in to sample the goods, take a look around, and enjoy the taste of something brand spanking new in our humble little borough of Dormont. For more info on Sugar and its owner, Kelly James, check out the following links. 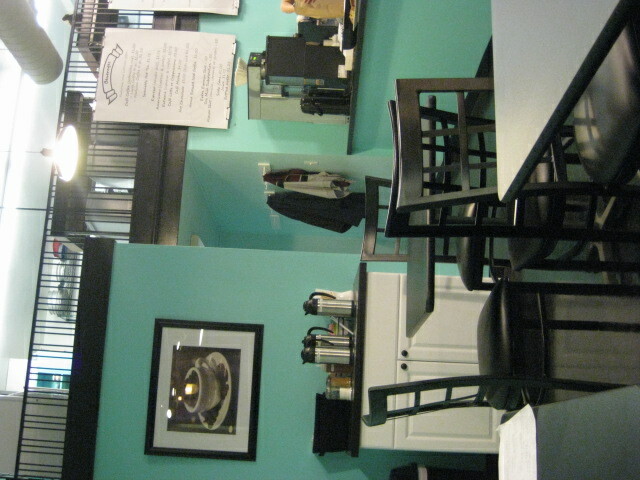 And of course, check out the cafe itself, located right by the Potomac T Station on Potomac Avenue. Also, apologies for my relative quietness this week. First it was too busy, then it was too nice outside to concentrate on typing. Rest assured, I have a ton of new posts coming up, including trips to Chaya and Sababa in Squirrel Hill. I’ve also been working on a few new features to debut, hopefully by the middle of next week, to run in addition to the general chatter that goes on around here. I’m going to cross my fingers and hope that I can get down to some serious writing business this weekend. Enjoy it while it lasts, kids. The temperature is going to drop drop drop come Sunday. I have yet to have anything from that was less than delicious from Potomac Bakery, but a mix of at-odds schedules and my workplace’s proximity to Graham’s Bakery in Mt. Lebanon has kept me from becoming a frequent customer. I should probably be thankful for this: The last thing I need is more food obsessions to empty my wallet and expand my waistband. 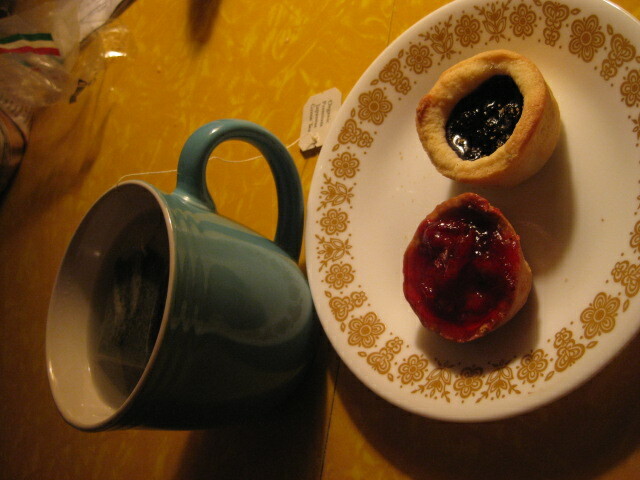 In regards to the picture, tea and pastries has become my absolute favorite thing to come home to after a long workday. I’ve always been a fan of the British scheduled tea-time, as it helps break up the day without making too much of an interruption in the middle of a work flow. Not to mention it’s a great excuse to drink a hot beverage and snack on something tasty. Were I able to, I would have a private ten-minute tea time every day, just around four, when my energy was getting supremely low and I needed something to push me through the last hour. Instead, I’ve taken to coming home from work, making a pot of coffee in the French Press or warming up a mug water in the microwave for tea, finding something on the sweet side to indulge in and just sitting down at my kitchen table to enjoy a few minutes of solitude, quiet, and light snacking. Perhaps with that post-work dream state in mind, I will be making more stops in at Potomac Bakery in the future. 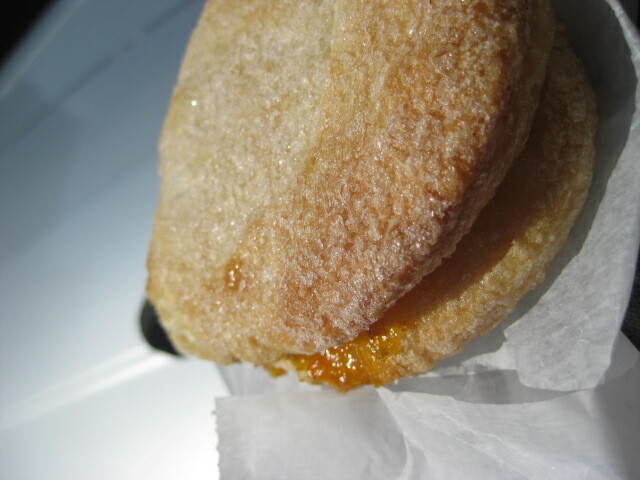 I’ve already got a plan for a few preserves-stuffed, sugar-dusted cookies I spied the other day while in the shop. You know how hard it is to walk past a bakery every morning and not buy a donut? Answer: When you’re me, it’s very, very, very hard. So it isn’t really fair of MSN.com to taunt me on their front page with a video of “How Doughnuts Are Made.” Rub it in, guys. Really. On the plus side, in the search for this video on YouTube, I found this donut-related clip. Who knew the Swedish Chef was such a gun nut?